Ensconced in a document that is over thirty-five years old, our nation’s acts, traditions, and conventions are fortified by their amend-ability. On April 17, 1982, during a blustery rainstorm in Ottawa, Queen Elizabeth II signed a proclamation to end what many scholars have called Canada's constitutional odyssey. While Canadians would hence forth have full legal control of their constitution, the political circumstances leading up to the agreement meant that discussions would continue for some time. The 1982 agreement did not bring constitutional change to an end. Instead, it was the beginning of another and even more complex evolution. 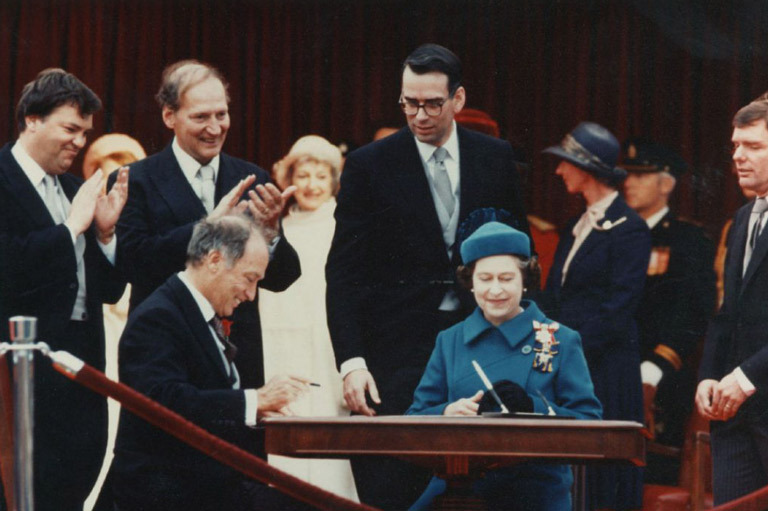 Pierre Elliot Trudeau and the Queen Elizabeth II prepare to sign Constitutional proclamation as Consumer Affairs Minister André Ouellet (left), Secretary of State Gerard Regan and Privy Council Clerk Peter Pitfield look on. When a nation state is formed, it generally adopts its own constitution. While written constitutions were relatively rare prior to the twentieth century, the United States stood as an example of an independent state with its own written constitution. Canada, by contrast, lacking the revolutionary change that occurred in the United States, achieved independence from Great Britain through a long evolutionary process. After Britain's parliament passed the Statute of Westminster in 1931, the only legal impediment to full independence was a lack of agreement on an amending formula for the domestic constitution. However, discussions on the amending formula would prove difficult, continuing until the early 1980s. After World War II, the main stumbling block to achieving constitutional independence went beyond a lack of agreement on an amending formula. Our inability to accommodate regional differences — economic and ethnic — in the country proved to be even more intractable. With the growth of the Quebec sovereignist movement during the 1960s and 1970s, divisions became very acute. Thus, the constitutional agenda involved not only constitutional provisions, but also the challenge of defining a vision of the whole country that would be acceptable to all regions. The first ministers' negotiations led by Pierre Elliott Trudeau in 1980–1981 resulted in the patriation agreement (otherwise known as “bringing home” the constitution), which passed into law despite the objections of Quebec premier René Lévesque, who wanted to take Quebec out of Confederation. However, discussions over the constitution involved not only Quebec, but all other regions in Canada, further splintering the debate. In particular, there was a strong push among western provinces to obtain provincial control over their natural resources. Added to these factions, aboriginal peoples expected more control over their own destiny and to be included in the discussions. Lastly, Trudeau wanted a written Charter of Rights and Freedoms, the centrepiece of which would be the protection of language rights. With so much at stake, the first ministers had to find a compromise. At an important conference in September 1980, the first ministers could not agree on a new constitution. The Trudeau government decided to proceed unilaterally, without the support of a majority of the provinces, so it should have come as no surprise when eight of the ten provinces challenged this action — taking it all the way to the Supreme Court of Canada and the Parliament of Great Britain. The federal government's unilateral move was found, ironically, to be legal but conventionally unconstitutional. This led to a meeting of the first ministers in November 1981, where nine of the provinces and the federal government came to a compromise, with only Quebec rejecting the provisions. The new constitutional provisions signed into law by the Queen in April 1982 were grafted onto the earlier constitutional provisions of the British North America Act, compiling what we now call the Constitution Act of Canada. There were some remarkable and far‐reaching changes. First, Canada adopted its own amending formula requiring provincial consent — in some cases, unanimous consent — for most constitutional changes. As well, the Charter of Rights and Freedoms guaranteed fundamental freedoms, democratic rights, and legal rights, along with nondiscrimination provisions, language rights, and the controversial notwithstanding clause. Among other unique provisions outside the Charter was section 35, guaranteeing aboriginal rights. As comprehensive as the document was, political division did not end there. Since Quebec had not agreed to sign the new constitution, there was lingering resentment, which was aggravated when a pro‐federalist Liberal, Quebec premier Robert Bourassa, was elected in 1985. Once again, all ten provinces and the Mulroney government came to an agreement about further constitutional change. Embodied in the Meech Lake Accord, the agreement was designed to persuade Quebec to endorse the Canada Act (i.e. severing ties between Canada and Great Britain). But it was never fully ratified. Another attempt was made for broader constitutional change in 1992 with the Charlottetown Accord. Put to a national referendum, Canadians voted it down. Thus, the 1982 amendments remain the last major changes to the constitution. How do we assess the development of our constitution? Initially, patriation was designed to deal with a number of specific problems. Chief among them was the question of national unity. But the referendum in 1995 over Quebec sovereignty graphically demonstrated how tenuous the link between the province of Quebec and the rest of Canada continues to be. Another challenge to national unity has involved the western provinces, specifically Alberta and Saskatchewan. “Western alienation” had reached a peak in 1981. Today, changes to the natural resources section of the constitution, coupled with shifting economic circumstances, seem to have mitigated the degree of perceived alienation. Patriation, together with an amending formula, was meant to strengthen national unity. Is Canada a stronger, more united country as a result of the 1982 agreement? Many would argue that Quebec did not agree to agree, leaving the country weaker and more fragmented. Others might point out that changes involving the Charter of Rights and Freedoms, natural resources, and native rights strengthen Canadian unity in important ways. Most constitutional scholars believe that we are only at the beginning of a process that requires ongoing tinkering. For example, court decisions based on the Charter of Rights and Freedoms regarding gender and sexual equality are generally perceived in a positive light. But courts have also expanded the rights of corporations, such as tobacco and private health corporations, which could prove detrimental for the social and physical health of Canadians. The jury is still out (no pun intended) on whether certain court decisions will be harmful or beneficial over the long term. For now, what we do know is that the 1982 changes — and court decisions based upon them — continue to reverberate in all aspects of Canadian life, acting, at times, like a thermometer gauging the social and political health of our country. Howard Leeson is a professor of political science at the University of Regina. During the constitutional negotiations of 1978 to 1981 he was the deputy minister of Intergovernmental Affairs for the province of Saskatchewan. This article originally appeared in the April/May 2007 issue of Canada’s History. On April 1, 1999 the map of Canada was re-drawn: the Northwest Territories divided into two territories to allow for the creation of Nunavut, a homeland for Canada’s Inuit. This webinar series shares information and promotes conversation about the historical and contemporary issues that relate to treaties. These presentations explore both the Canadian and First Nations perspectives of treaties. How a mob of men from a “respectable class” almost smothered an infant democracy.